Kevin H. Mosser, MD, is a seasoned health system executive with experience in all facets of quality and operations performance including physician practice management, organizational integrity, quality improvement, culture development, and fiscal discipline. Most recently, Dr. Mosser served as the president and chief executive officer of WellSpan Health. WellSpan Health is an integrated health system of eight hospitals, more than 1,000 physicians, and over 200 ambulatory sites. Over a period of five years, Dr. Mosser seamlessly integrated four new organizations into WellSpan and increased organizational growth from 1.2 billion dollars to 2.9 billion dollars. 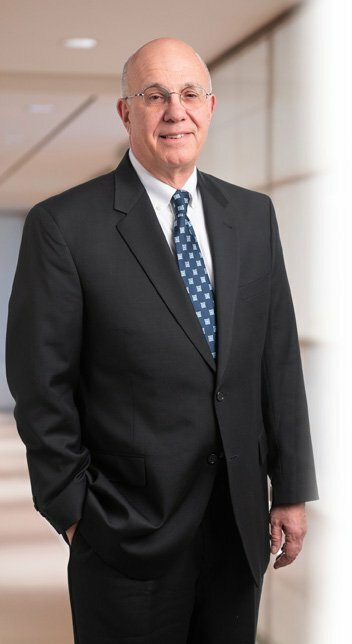 Utilizing his experience, Dr. Mosser serves as a senior medical consultant for Saxton & Stump. In this role, he provides value to clients by applying his knowledge of the healthcare industry to support the firm’s medical professional liability defense lawyers by providing clarity into clinical issues within cases. Over his 30-year career in the healthcare field, Dr. Mosser served in various positions within WellSpan Health. These positions include as the executive director of York Health System Medical Group; the president of WellSpan Gettysburg Hospital; the executive vice president and chief operating officer overseeing WellSpan York Hospital, WellSpan Gettysburg Hospital, the WellSpan Medical Group, WellSpan Speciality Services, and system-wide clinical programs; and president and CEO of WellSpan Health. As the executive director of the York Health System Medical Group, which later became WellSpan Medical Group, the enterprise grew from about 60 doctors to 200 doctors, unified its billing operations and infrastructure, and initiated group wide compensation and quality programs. Dr. Mosser led WellSpan Gettysburg Hospital in improving service, quality, and efficiency. During his time with WellSpan Gettysburg Hospital, the hospital was named as a “Top 100 Performance Improvement Leader” by Thomson Healthcare for two consecutive years. In his role as CEO of Wellspan, he focused on performance improvement and enhancing integration and care coordination for WellSpan while successfully integrating the facilities and physicians of Ephrata Community Hospital, Good Samaritan Hospital in Lebanon, Philhaven, and Summit Health. As an active member of the local healthcare community, Dr. Mosser has served as the Chair of the Pennsylvania Trauma Systems Foundation Board, on the Community Advisory Board of Penn State Mont-Alto, and as a Board member of the Big Brothers/Big Sisters of York and Adams counties. He recently completed service on the Hospital and Health Association of Pennsylvania board of directors and of Hospice and Community Care, where he served on the executive and quality improvement committees. He is currently the President of the New Birth of Freedom Council, Boy Scouts of America. Perelman School of Medicine, University of Pennsylvania, M.D. Over five years, four new organizations were seamlessly integrated into WellSpan. Organizational growth increased from 1.2 billion dollars to 2.9 billion dollars.